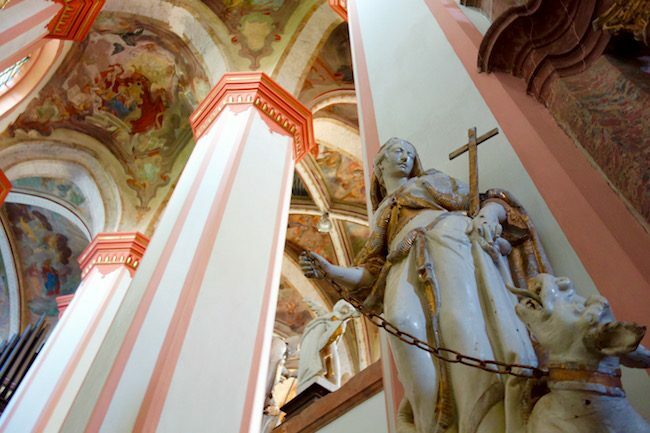 Tepla Monastery makes an intriguing day trip from Karlovy Vary, Marianske Lazne or even Prague. 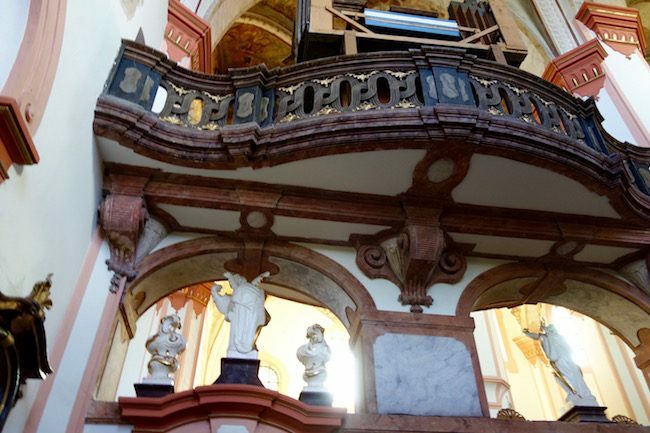 Located in the Czech province of Bohemia, this ancient monastery has a 12th-century church, a famous Neo-Baroque library and a heart-breaking past. As the formidable female guide at Tepla Monastery in the Czech Republic delivers a tour in Czech, my private guide for the day, Alena, a ski buff from the nearby spa town of Marianske Lazne, translates it into English for me. The monastery guide stops in mid speech and tells us to be quiet. “But I’m just telling her what you said,” Alena says in Czech, motioning around the cavernous Museum Hall filled with some of the oldest surviving objects from the monastery. “There are written English translations,” the guide replies sternly. She’s partially right. 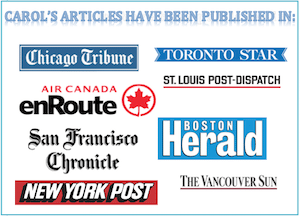 I do have an English printout only it skips most of the exhibits. It also tells me I will see exciting things such as Leiden bottles and incumabulae from the 14th to the 16th century, and, as I have no idea what Leiden bottles or incumabulae are, it may as well be written in Czech. Alena and I can’t help it. We look at each other and start giggling. 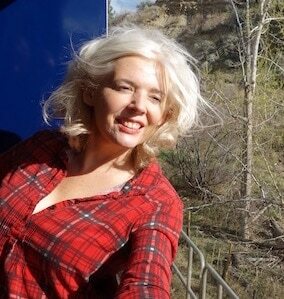 I’m not laughing in derision, I’m laughing in delight. This vast hall is filled with unexpected curiosities such as Baroque organ pipes, obscure land surveying instruments and a copy of a letter from King Ferdinand asking the Abbot of Tepla if the nearby mineral springs could be used in the production of kitchen salt. The exhibit is a bit run down and that is its charm. If it were a slicked-up modern museum, I’d feel much more removed. As it is, I feel I’m touching Tepla’s heart, even if I don’t have a clue what Czech beat that heart is pumping to. If you want an atmospheric attraction in the Czech province of Bohemia, Tepla Monastery is graceful, spiritual and dishevelled, layered in history and battered by history and time. It is also a symbol of hope and restoration, and has one of the most magnificent monastery libraries in the Czech Republic, second only to the Strahov Monastery in Prague. 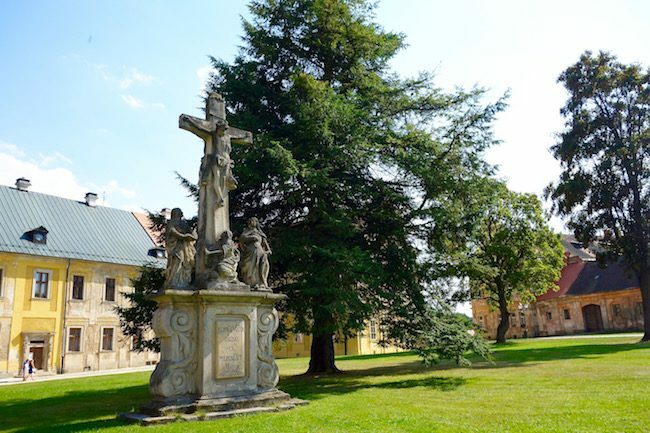 A good day trip from Karlovy Vary, Marianske Lazne or even – if you have some serious stamina – from Prague, Tepla Monastery (also called Tepla Abbey) has a turbulent history filled with robber knights, the plague and communist persecution. The Tepla Premonstrate Monastery was founded in 1193 by a nobleman named Hroznata, who was the commander of the border-defence in the region. When he failed to go on the Third Crusade as he’d vowed to, he founded the monastery to make amends. It was clearly a labour of love and he entered the monastery as a member of the order soon after. Those were dangerous times, however. One day, while he was out inspecting the estate he was seized by a band of robber knights and held for ransom. Hroznata’s first consideration was the monastery. Unwilling to let the abbot bankrupt Tepla on his behalf, he died in captivity in 1217. If there was ever a tale of devotion, this is it. Since then Tepla Monastery has undergone a number of horrendous attacks, and it’s only due to this intense devotion of the Premonstrate order that it’s been kept alive. A plague ravaged the community in 1380, Swedish soldiers raided it during the Thirty Years’ War and in 1659 it was burned to the ground. After being reconstructed in the Baroque style in the late 17th century, the monastery flourished and became a place of science and learning. In 1888 it was expanded and a brewery, pharmacy and stables were added. In the 1900s a new wing with the Neo-Baroque library was added. In the 19th century one of Tepla’s abbots, Karl Reitenberger, founded the spa town of Marianske Lazne and asked the monastery physician, Dr. Jan Josef Nehr, to study the healing properties of the mineral springs of what is now one of the Czech Republic’s finest spa towns. It’s after our group has shuffled into the ornate Annunciation of the Lord Church, a highlight of any Tepla Monastery tour, that I learn how far Tepla had yet to fall. After the Communists seized power of Czechoslovakia in 1948, things rapidly went downhill and the monastery was shut down in 1950. It was a terrible time for monasteries all over the country. Monks were imprisoned and monastery property seized. 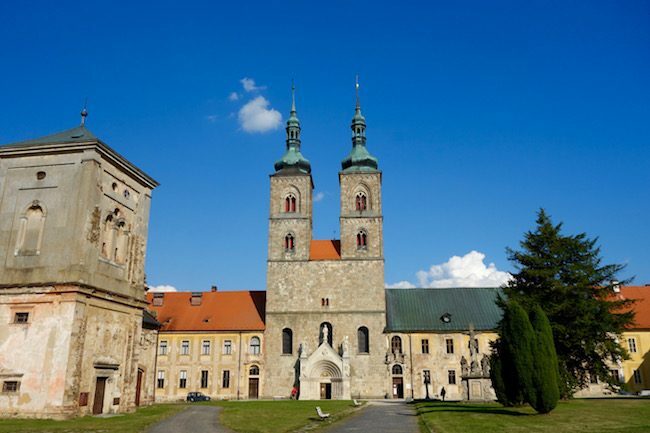 Gazing around the church, admiring its exceptional Romanesque-to-Gothic exterior and flowery Baroque interior, I’m amazed it survived at all, because for the next 28 years, Tepla Monastery was used as a barracks for the Czechoslovak People’s Army. 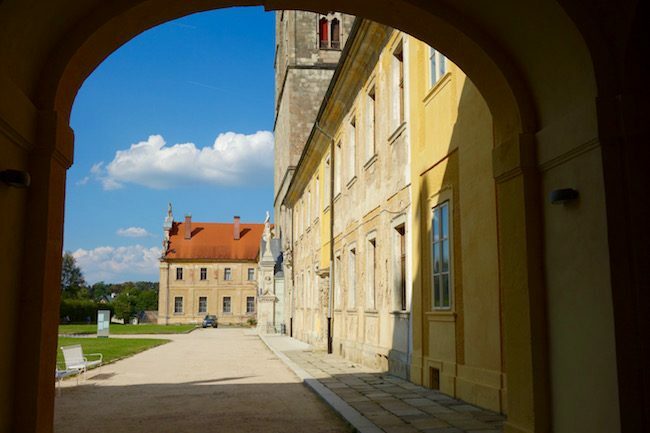 The beautiful gardens were used for tank exercises, sewage went into the cellar vaults, books were burned and weapons were stored in the priceless Neo-Baroque library. It wasn’t until 1990 after the Velvet Revolution that the monastery, battered and crumbling, was returned to the Premonstrate order. Once there were 130 monks at Tepla. Today, there are 14 and they face the seemingly impossible task of restoring the buildings and grounds to their former glory, but – along with money from the EU, Alena whispers as we move into the library – they’re doing an admirable job. Today the library, which holds some 100,000 historical books and manuscripts, is once again attracting scholars who come to view rare items such as the Poenitentionale, a German liturgical text from the 9th century, and a prayer book of King Ladislav from 1453. The library is hushed and peaceful and our group falls silent as we stand under the lavish ceiling frescoes. 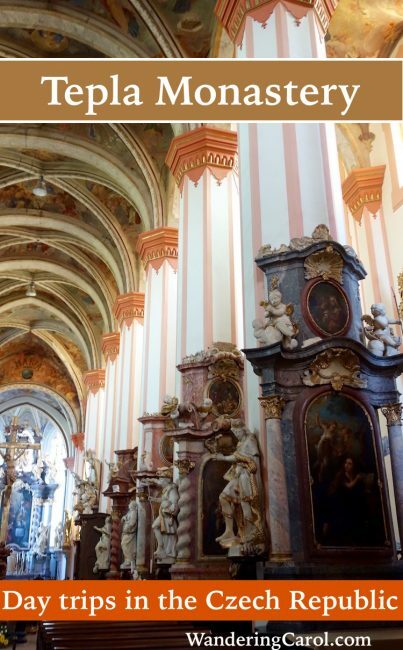 While this Neo-Baroque addition isn’t as old as some of the other parts of the monastery complex, it feels alive and ancient, maybe because of the weathered age of some of the manuscripts – the oldest is the Strahov Gospel from 860 – and the hundreds of man hours it took to create them. I can almost hear the scratches of ink quills on paper as I look around. Much of the Tepla Monastery estate may still be in disarray, with peeling paint and faded walls, but the chapel and the library show its staggering beauty and full potential to shine once again. And, with the devotion that has fuelled Tepla for nearly 1,000 years, I have no doubt the struggle to restore it fully will eventually succeed. The spiritual heart of Western Bohemia in the Czech Republic, Tepla Monastery makes an easy day trip from Karlovy Vary or Marianske Lazne. If you’re travelling from Karlovy Vary, combine it with a stop in Marianske Lazne (the spa town of Marienbad) for an ideal one-day excursion. Visit my Things to do in Marianske Lazne post to plan your itinerary. Tepla Monastery is located at Klášter premonstrátů Teplá. Tel: +420 353 392 732. The town of Tepla is situated on the Tepla River, about 20 km east of Marianske Lazne and about 46 km from the spa town of Karlovy Vary. Getting to Tepla from Prague. 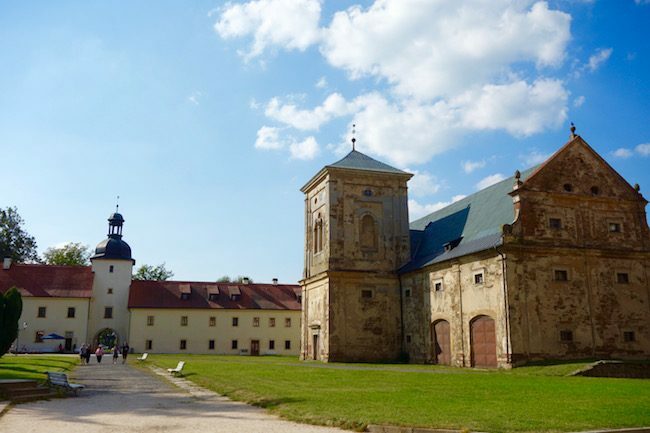 Tepla Abbey is about 140 km from Prague, which makes it just over a two-hour drive. To explore the interior of the monastery you need to sign up for a tour. We didn’t book beforehand, but just showed up and took the first tour we could. Tours of Tepla don’t run in Nov, Dec, Jan, Feb. You’d need to make special reservations to tour it. In March, April and Oct tours run from 10:00 a.m. to 3:00 p.m. and on Sundays 11:00 a.m. to 3:00 p.m. From May to September they run from 10:00 a.m. to 5:00 p.m. and on Sundays 11:00 a.m. to 5:00 p.m. The monastery also runs many cultural events through its Hroznata Academy Cultural and Education Centre. The grounds of Tepla Monastery are lovely to walk around in. There is also a historic cemetery. There is a restaurant in the complex where we had lunch (and I enjoyed my schnitzel very much). If you’re looking for another fun day trip from Karlovy Vary, Marianske or Prague, read One day in Loket. Make it more than a day trip. If you want to stay and spa at Marianske Lazne, read the Easy Way to Spa in Marianske Lazne. For more information on Czech Republic travel visit The Czech Tourism Board.